Shop For Accordion Case at ShopWorldlux: check prices, availability, deals & discounts. Get Accordion Case to meet your needs at Shop Worldlux. D'Luca Accordion Gig Bags are professionally designed to safely and conveniently transport your beloved accordions. 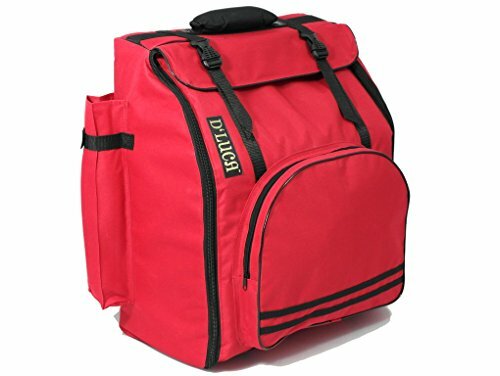 This durable backpack style Accordion Gig Bag is constructed with rip stop Nylon and is lined with 20 mm padding which cradles your instrument from every angle for a full time protection. Features front and side pocket for music sheets, music stand, extra straps and accessories, Heavy-duty Padded Nylon Carrying Handle, Adjustable Padded Shoulder Straps, Zippers on each side of the bag to easily maneuver the accordion in or out with no hassle. DAG-96/120 Model fits: 80 Bass Piano Accordions, 96 Bass Piano Accordions, 120 Bass Piano Accordions. Weight: 4 Lbs. Size: 22" L x 10" W x 21" H. Made in Mexico. 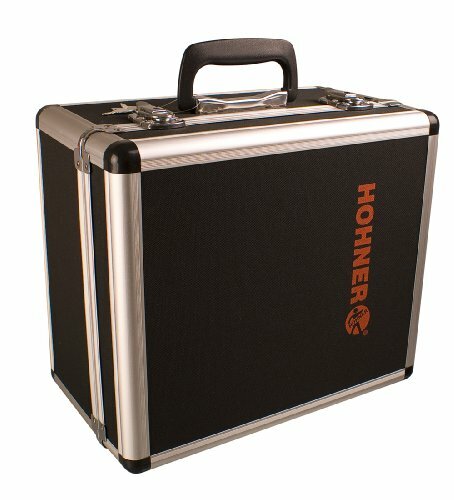 Hohner's hardshell accordion carrying case. Corona Gig Bag made specifically to fit Hohner's Corona three-rwo button accordion models. 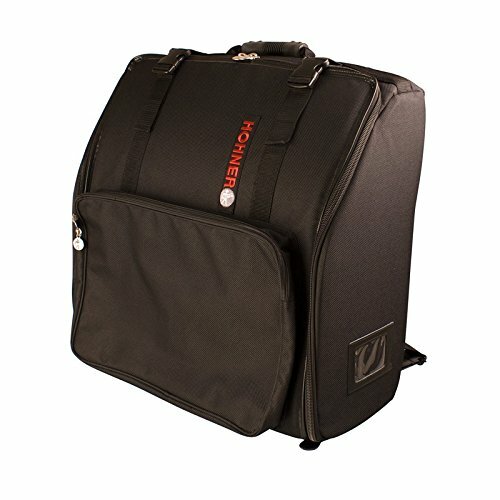 Specification *Color:Black * Material:Polyester *Size:20.5 x 17 x 9.8 in（52*43*25cm） Feature * Fits 120 bass gig bag. * Heavy-duty polyester material keeps things dry and clean. 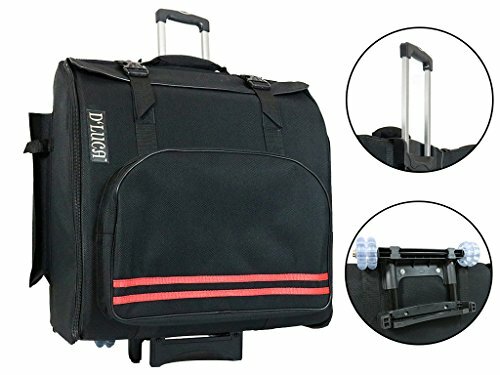 * Comfort ergonomics design carry system, well padded carry strap Package Include 1 x Accordion Gig Bag Please Note 1.When you order it,please measure your accordion size. 2.This accordion bag is Water-resistant,please don't put it in a heavy rain. The DeLuca Accordion case will make the transportation of your accordion easy and most importantly, it will keep your accordion safe. It’s a strong and sturdy accordion case. Features plywood construction reinforced with an aluminum frame and metal fasteners. Protection from all angles. The case is equipped with four wheels that roll in any direction. Retractable locking handle that allows you to push, or pull your accordion case with little effort. Fits Most 60 Bass Piano Accordions. The interior measures 18 inches long by 18 inches width by 9.25 inches deep approximately. Exterior dimensions are: 18.75 inches length by 11.25 inches width by 22.25 inches height. Note: Width measurements include travel handle. Height measurements include wheels. Weighs: 11.40 pounds. 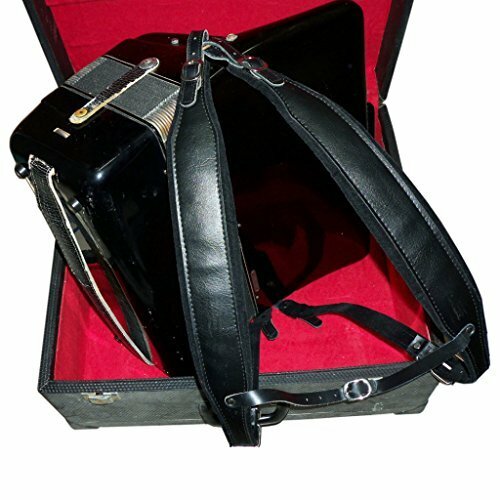 DeLuca Accordion Gig Bags are professionally designed to safely and conveniently transport your beloved accordions. 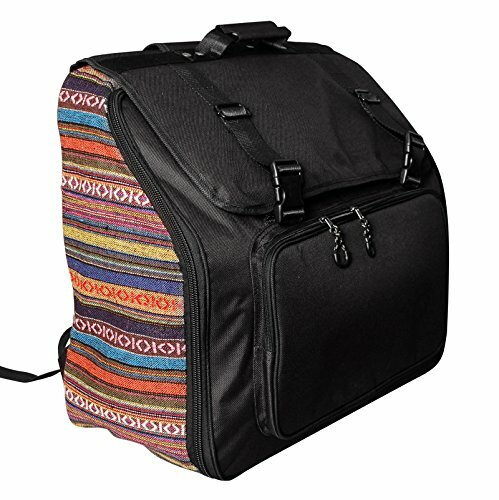 This portable Accordion Gig Bag is constructed with rip stop Nylon and is lined with 20mm padding which cradles your instrument from every angle for a full-time protection, this Accordion Bag includes handle and wheels for easy transportation and portability. 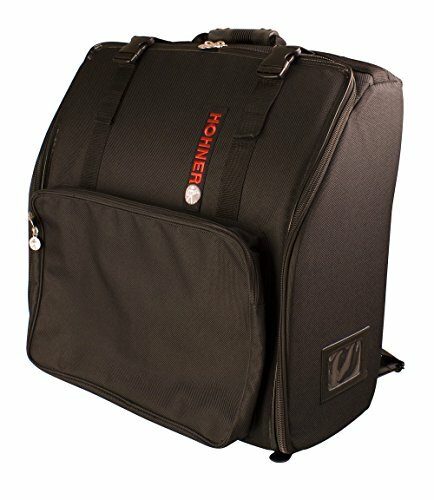 Features front and side pocket for music sheets, music stand, extra straps and accessories, Heavy-duty Padded Nylon Carrying Handle, Adjustable Padded Shoulder Straps, Zippers on each side of the bag to easily maneuver the accordion in or out with no hassle, wheel base and handle for easy transportation. DAG-96/120 Model fits most: 80 Bass Piano Accordions, 96 Bass Piano Accordions, 120 Bass Piano Accordions. Bag Dimensions: 21" L x 10" W x 21" H. Weight: 5 Lbs. Made in Mexico. MUSIC FIRST original design Country Style Piano Accordion case accordion bag, Fit for 96~120 Bass Piano Accordion / Shell fabric: Black 1200D Nylon Oxford + Pure Cotton Country Style Fabric / Lining: Brown VelVet / Padding: 0.5 inch (12mm) EPE, Durable/Water Proof/Protect your accordion very well. / Comfort Ergonomics Design Carry system, Well padded Carry Strap, Width: 3.2in (80mm), Thickness: 0.4inch (10mm). Free your Shoulder. / Use Brass rivets and Metal Accessories, Firm and Beautiful. / Unique & Origianl Country Style design, Looks Great! This bag interior is padded ( about 7mm thick), it can give a good protection to your 120 and 96 bass accordion. About this bag size, please veiw above picture, then you will know. D'Luca Accordion Gig Bags are professionally designed to safely and conveniently transport your beloved accordions. 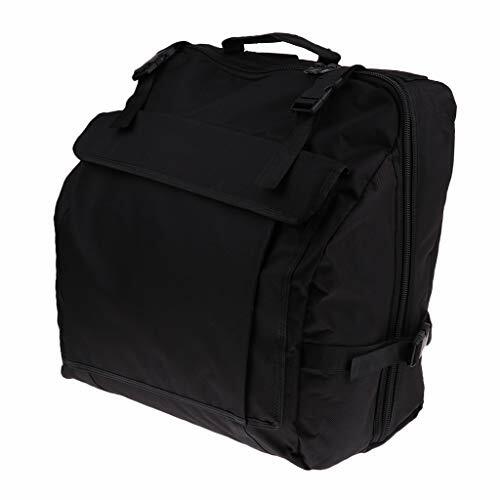 This durable backpack style Accordion Gig Bag is constructed with rip stop Nylon and is lined with 20 mm padding which cradles your instrument from every angle for a full time protection. Features front and side pocket for music sheets, music stand, extra straps and accessories, Heavy-duty Padded Nylon Carrying Handle, Adjustable Padded Shoulder Straps, Zippers on each side of the bag to easily maneuver the accordion in or out with no hassle. DAG-34 Model fits: 34 Keys Button Accordions, Chromatic Size Accordions, 3 Row Button Accordions. Weight: 3 Lbs. Size: 15" L x 10" W x 16.5" H. Made in Mexico. D'Luca Accordion Gig Bags are professionally designed to safely and conveniently transport your beloved accordions. 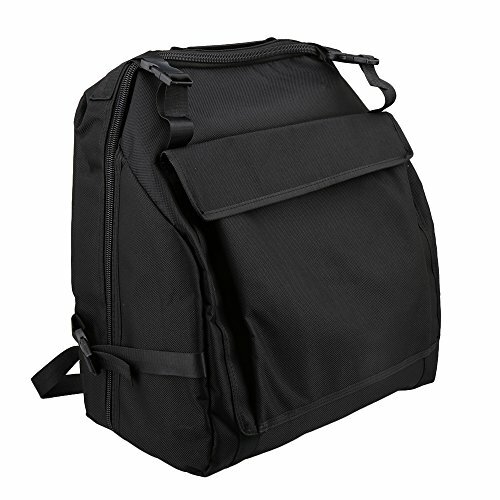 This durable backpack style Accordion Gig Bag is constructed with rip stop Nylon and is lined with 20 mm padding which cradles your instrument from every angle for a full time protection. 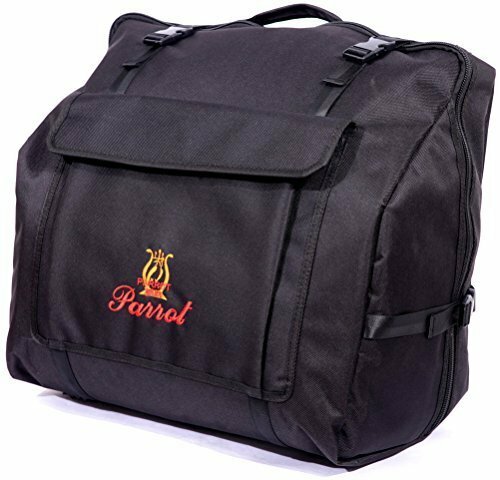 Features front and side pocket for music sheets, music stand, extra straps and accessories, Heavy-duty Padded Nylon Carrying Handle, Adjustable Padded Shoulder Straps, Zippers on each side of the bag to easily maneuver the accordion in or out with no hassle. DAG-12 Model fits: 12 Bass Button Accordions, 1,2 and 3 Row Button Accordions, Panther and Corona Models. Weight: 3 Lbs. Size: 14" L x 9.5" W x 15" H. Made in Mexico. Welcome to our store. If you love Sports and Outdoor Activities ,we will provide what you want, and give your much surprise.Description: - Soft Padded Black Accordion Backpack for Bass Accordion Gig Bag - Waterproof oxford material, protects your accordion very well - Thickness Poly padding provides shockproof - Adjustable shoulder straps,hand portable - With pockets, easy to carry on your accordion accessoryPackage Includes:1 x Soft Accordion case The accordion is not included.Note:Due to the difference between different monitors, the picture may not reflect the actual color of the item.Due to manual measurement, there may be 1-2mm error in size. The DeLuca Accordion case will make the transportation of your accordion easy and most importantly, it will keep your accordion safe. Features plywood construction reinforced with aluminum frame and metal fasteners. Protection from all angles. The case is equipped with four wheels that roll in any direction. Retractable locking handle that allows you to push, or pull your accordion case with little effort. Fits most 48 Bass Piano Accordions. The interior measures 16.75 inches long by 17.25 inches width by 9 inches deep approximately. Exterior dimensions are: 17.75 inches length by 10.75 inches width by 21 inches height. Note: Width measurements include travel handle. Height measurements include wheels. Weighs: 10.65 pounds. Hohner piano accordion Gig Bag made specifically to fit Hohner's Bravo 48 Bass accordion model. The DeLuca Accordion case will make the transportation of your accordion easy and most importantly, it will keep your accordion safe. Features plywood construction reinforced with aluminum frame and metal fasteners. Protection from all angles. The case is equipped with four wheels that roll in any direction. 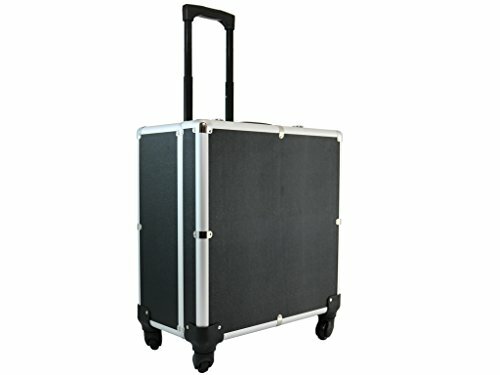 Retractable locking handle that allows you to push, or pull your accordion case with little effort. Fits: 34 Keys Button Accordions, Chromatic Size Accordions, 3 Row Button Accordions. The interior measures 16-inches long by 16.5-inches width by 8-inches deep approximately. Exterior dimensions are: 16.75-inches length by 10.75-inches width by 20.50-inches height. Note: Width measurements include travel handle. Height measurements include wheels. Weighs: 10 pounds. 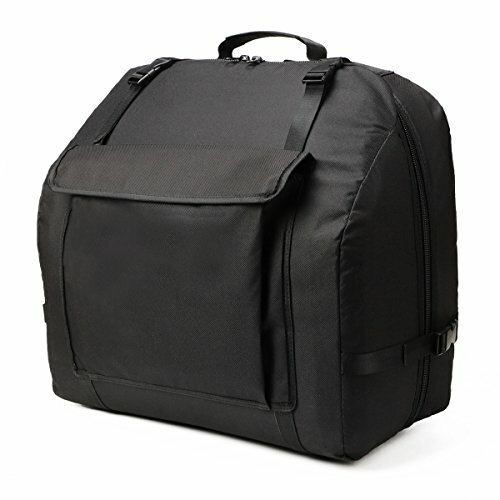 The outer skin of your gig bag is made of tear proof Cordura and features multiple seams. It's cushioned and stiffened so that your instrument can withstand substantial shocks. These bags also sport several additional features. From the 48-bass size on, the gig bags have a large pocket for sheet music, another for notepaper as well as pen pockets and a holder for a music stand. 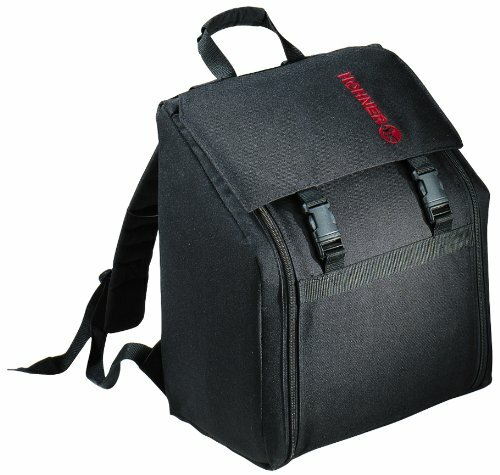 Adjustable, cushioned shoulder straps on the gig bag provide for an ergonomical fit. Fits: Bravo II 48, Amica II 48, Student 48, Club II B, Club Norma III, Club Norma IV M de Luxe, Nova II 48, 60A, 80A, Fun Nova II 80 Light. 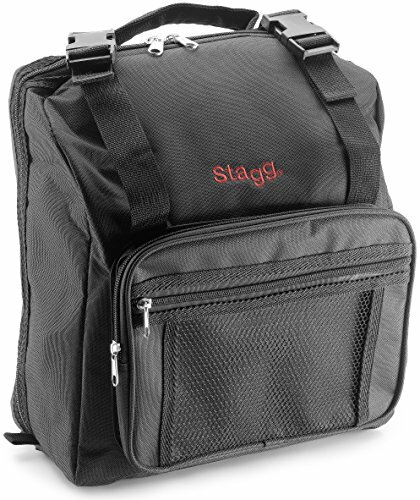 Gigbag 48-suitable for the 48 bass accordions. "Specifications: Material: 1200D oxford cloth Color:Black Brand name: BQLZR Size:48x52cm/18.9x20.47inch(L x W) Weight:990g Features: 1. 2 shoulder straps for easy transportation 2. zips covered on the inside to protect accordion 3. Made of 1200D oxford cloth,Hard Wearing and Durable. 4. It is fit for 120 accordion bass. Package include: 1 x Accordion Bag"
The Hohner Santa Marsala button style, diatonic accordion in the key of GCF. It has three button rows, with sharps on the third row. Bass notes and chords are played depending on the root note button depressed when the bellows is pushed in or pulled out. 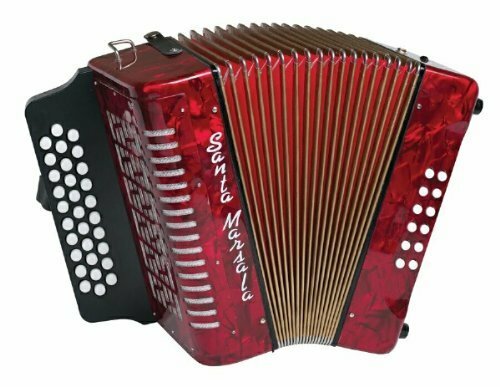 The Santa Marsala comes in a stunning red pearloid finish, and includes it's own deluxe accordion case and shoulder strap. 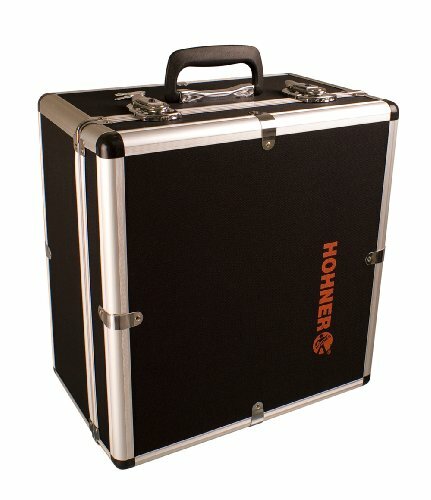 Looking for more Accordion Case similar ideas? Try to explore these searches: Rio Wave, Charity Pot, and Locking File Cabinet. 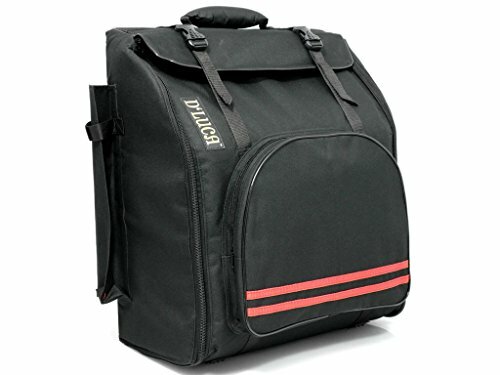 ShopWorldlux.com is the smartest way for save money on Accordion Case: compare prices of leading online stores for best shopping ideas. Don't miss TOP daily updates DEAL.